Jeff and Kitty Katt-Martini have learned the ins and outs of Washington politics, not to mention how to prevail in intergalactic war and foil dangerous plots. But, in the aftermath of Operation Destruction, the Gower girls’ powers are burned out, the entire A-C population has been “outed” as the aliens living on Earth that they are, and, worst of all, ACE is nowhere to be found. Then murder and mayhem are served up at an important dinner party at the American Centaurion Embassy, and when the dust settles Alpha Team and the Diplomatic Corps have more problems than just a dead Congressman. 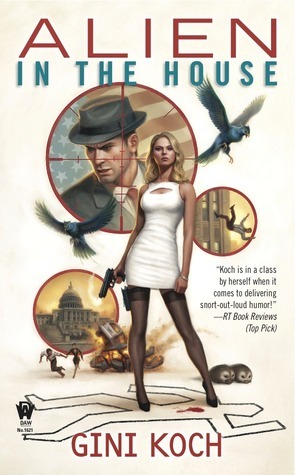 Is there a single criminal mastermind—or multiple enemies—behind all the conspiracies that want Kitty dead and the A-Cs gone or co-opted to become the War Division? The return of the best assassins in the business, the reappearance of two individuals long-presumed dead, Agent Malcolm Buchanan felled by something no one can identify or cure, and new technology that can block even the most powerful empath on Earth … all of this means the game’s officially afoot.hen Vance Beaumont comes to Kitty with a wild theory that someone is systematically killing off the House of Representatives…It’s up to Kitty and the rest of the gang to find out what’s really going on and why. But will they be able to stop the killer or killers before the rest of the U.S. House of Representatives become casualties? And will the replacement Representative for New Mexico’s 2nd District, who happens to be Jeff Martini, be the next to die?